Before 1971 Britain had an unusual non-decimal money system. This may seem a little strange now, but when taught from a very early age it came naturally. Also it did have a few advantages, for example it was easy to split one Pound exactly between 3 people - each one would be given 6 Shillings and 8 Pence - also 1 pound could be split exactly into 4, 5, 6, 8, etc. The way of writing a price in this system was easy - a sum of money comprising 21 Pounds 15 Shillings and 11 Pence would be written £21 15s 11d (or £21/15/11). 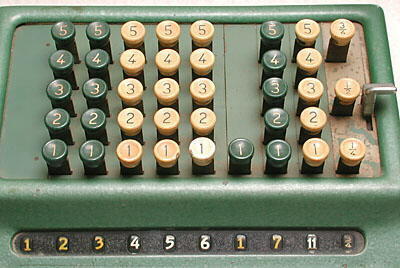 As can be imagined, this complicated system caused difficulties when calculating, especially multiplying and dividing. It was possible to use a standard decimal calculator by using tables to convert from Shillings and Pence to fractions of a Pound and vice versa. However, special versions of the simpler calculators (Comptometers, adding machines, 10-key add-listers, and addiators) were made which worked in Pounds, Shillings, & Pence. Above is a photograph of the keyboard of an old Sterling Currency (£sd) Comptometer made by the Felt & Tarrant company, a rival of Bell Punch, which has a complete full keyboard. A further complication was that the penny was split into 2 half-pennies and 4 farthings, and keys with these sub-divisions often also appeared on adding machines. The farthing ceased to be legal currency in Britain in 1961. This photograph shows a Plus 509/F Adder which has an abbreviated keyboard (to key in a number above 5 in any column you have to press two keys in succession which add up to the number required), and also has a column of farthing keys on the right. Several other countries, mainly from the British Empire/Commonwealth, had also used a similar monetary system but all changed to decimal systems by 1971. 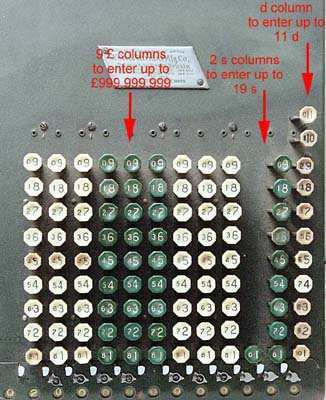 Bell Punch made many "Comptometer" type mechanical calculators for the old Sterling currency, and perhaps the only electronic calculator that was capable of displaying in the Sterling currency, the Anita Mk 10.